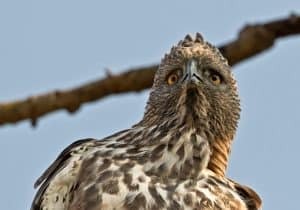 The Eagle Bird family in Indonesia is divided into several types, spread evenly throughout the Indonesian mainland and archipelago from Aceh to Papua (West-East) and from P.Miangas, North Sulawesi to P.Rote, East Nusa Tenggara (North-South). 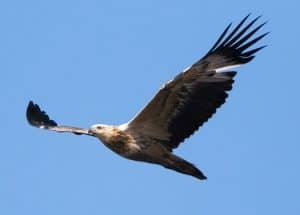 The diversity of species of eagles in Indonesia plus cold country eagles that migrate to Indonesia avoid winter in their place of origin. 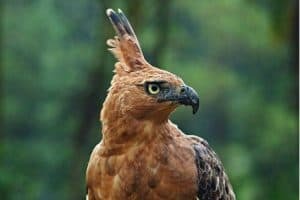 In Indonesia, this species of Eagle is known as Alap-alap, Rajawali, Sikep honey, Baza, or garuda. His appearance is very manly and some types can reach a life span of more than one hundred years. Many types of eagles in Indonesia are extinct. So, if there is no strict protection effort, the Indonesian state emblem will be extinct forever. Medium-sized birds (70cm), but look great when flying. It is dominant in terms of fighting so it has a high survival rate. It spreads at an altitude of 300 – 2000mdpl. It is quite common in primary forests and plantations. Sometimes it seems to be in the forest village. As the name suggests, this eagle is black-and-white except for young individuals who have a pattern resembling Eagle Brontok. The wings are typical, sturdy and wide stretching, looking very large with a long tail. Adult: The color of the dark hair is concentrated, except for the tail that has a brownish pattern. Teenagers: Chest patterned lines like the bright Phantom Brontok. 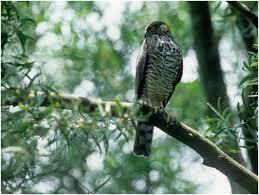 Medium sized birds (50 – 60cm), noisy and very easy to find at all altitudes. 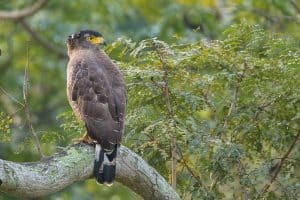 Adaptive bird species, can be found in many habitats ranging from primary forest, secondary forest, plantation, coastal forest, savannah and sometimes to the settlements. Although its name is Eagle – a snake, but does not always eat snakes. Blowing wings form the “C”, round and has a thick white line on the edge of the wing. Short tails sometimes twitch. It has yellow hairless part of the eye. It’s dominant fur color of dark brown to black, touch – white spots on the chest and abdomen. It is very much like flying soaring or gliding at altitude or guerrilla fly among the titles to hunt. It is very fond of voiceless, storm with whistle “Kli – kliuw” or “kliiw”. Feed the snakes, mice, lizards, squirrels and other small animals. Medium-sized birds (60cm), it is very famous for its scarcity. At the time of the new order the symbol of the country of Indonesia. It looks handsome but actually coward and very easily defeated by other species hawks. It occupies a primary forest and an altitude of 300mdpl feet. As the name implies, it is endemic in Java. Many people think that Garuda is a bird species. Actually, Javanese Eagle is the Garuda itself. In other words, Garuda, the symbol of the country we are proud of – is a kind of eagle called Javanese Eagle. The wing will roll and bend slightly upwards when it’s soaring. The head is not too small, proportional to its tail that is somewhat longer than the eagle bulging. It has dominant color of red chocolate, a white chest lined horizontally on adult birds and plain chocolate on young birds. Some experts often call it Nizaetus bartelsii. Medium-sized birds (60cm), it is very similar to the Javanese Eagle. As the name suggests, it has two phases namely the dark phase and the bright phase. More widespread than his brother and occupies a more diverse habitat. It has many races and many forms, some are crested, some do not. Some say the name of the brontok virus is inspired by this bird’s name. Some experts included it in the genus Nizaetus, some of which also isolated the S. cirrhatus limnaetus race into its own race. The wing rounded and bent slightly upward, similar to his brother Javanese Eagle. The difference is a slightly shorter tail, two bright spots on the wings and a vertical line in the chest at the bright phase. The Eagle is very spectacular, very large (70 – 85 cm). Its size can be regarded as the king of the sea. It lives on the coast and sometimes into the lowland forest. There is a live record in the highlands. Very large size, long wings wide and wide, long head and tail very short form wedge. It is a medium size bird (60cm). Not included in family acciptridae, but separated in a separate family, Pandinidae. Unfortunately in Indonesian his name is still called “Eagle”. Spread across the coast. It is medium size bird (30 – 45cm) with a unique flying way. At a glance similar to the flames, but the wings are more rounded and their bright eyes. It spreads in the lowlands and hills up to 2000mdpl altitude. Included in the “kite” category which means it’s like flying hovering which rarely can be done by other types. It has a black spot on the shoulder, a typical long black primer. in adult eagles, it will have crown colors, backs, protective wings, and gray tails; face, neck, and bottom of white. Teen: brown in color. When looking for prey, like to hover silently while flapping – flapping the wings. The characteristics are Red iris, black bean with yellow sera, and yellow feet. He likes to perch on dead trees or telephone poles. Hover over its prey as described above. Lovers of hunting in a dry open area with scattered trees – sparrows. Prey Grasshoppers, snakes, mice or young birds. It is a medium-sized bird (45cm). 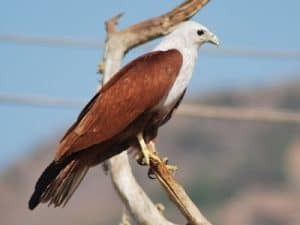 Brahminy Kite is quite well known as the mascot of Jakarta, though its population is very annoying in his city. You can recognize it by looking at the busway logo. At a glance similar to the American Bald Eagle, but the size is clearly much smaller. It is included in the “Kite” category which means having a flying hovering skill that is rarely other types. It’s white and brown blonde. 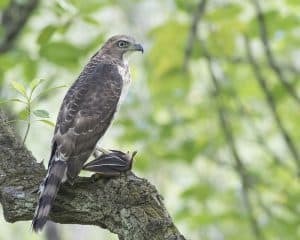 Adults: head, neck, and white chest; wings, backs, tails, and bright brown stomachs, are contrasted with black primary fur. The whole of its body is brownish body with a doodle on the chest. The color turns grayish in the second year, and reaches full adult hairs in the third year. 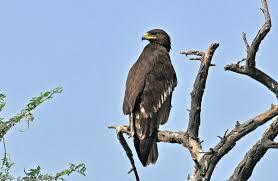 The difference between a young bird and a Paria eagle on the tip of the tail is rounded rather than scratching. It has brown iris, beanbag and dark green sands, gray leg and leg. 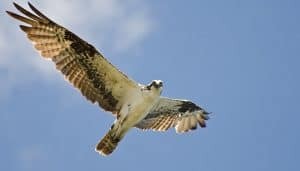 It is a type of medium sized bird and very similar to Japanese eagles except its larger size. Unlike his brother, Elang – alley Besra is a rarer reptor who is rarely found in Java Island. The medium-sized animal (33 cm) is similar to the Elang Jambul Elang but smaller and without a crested jaw. Adult male, upper body dark gray with thick dotted tail, bottom white body with brown horizontal line and red side of body, white texture with black strip in middle, black black striped strip. She really likes to sit quietly in the jungle waiting for her prey. It also likes perching on high dead trees in the forest. It will fly around on a regular basis. It is the third twin bird with the Besra Elements and the Japanese Eagle. The size is the largest among his two brothers (40cm), besides that he also has a crested face seen when perched. His body was stretched with a clear cloak. 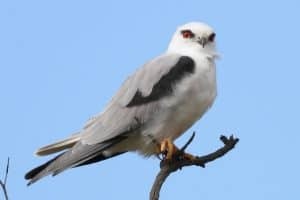 The adult male has a gray upper body with stripes on the wings and tails, the underside of the red car, the black-tailed chest, there is a thick black striped line in the abdomen and white thighs. The white neck with a black slit drops towards the throat and there are two drops of mustache. Females and females: like adult males, but streaks and horizontal lines on the lower body are brown and the upper body of the chocolate is pale. He loves to hunt down the low hills in the sea. In addition, it always lives in dense forests. At the time of the breeding occasionally show a typical flying way, ie the vibration of the wings (white feathers on the sides of the body is apparent) in the short jump in a narrow circle. Those are the types of eagle in Indonesia. After reading the articles, you might be sad knowing some of the eagle population in Indonesia has been rare. Here is the job of us to conserve the eagle population.